The recreational rock lobster season in the Western Region (waters west of Point Sorell around to Whale Head) opens this Saturday, 5 November. Fishers can set their pots from 1pm this Friday, then pull them after midnight when the season is officially open. The Western Region daily bag limit is 5 rock lobster and the possession limit is 10. The boat limit is 25, irrespective of the number of days fished. Fishers are not allowed to possess any rock lobster or rock lobster pots or rings in the Eastern Region until the scheduled opening on 19 November. Lobster samples for PST testing from every biotoxin zone apart from the Furneaux Zone have been collected over the last 7 days. These samples have been processed and dispatched to the laboratory in Sydney for analysis. The earliest date that we anticipate being in a position to communicate the open/closed status of each zone is Monday 14 November. 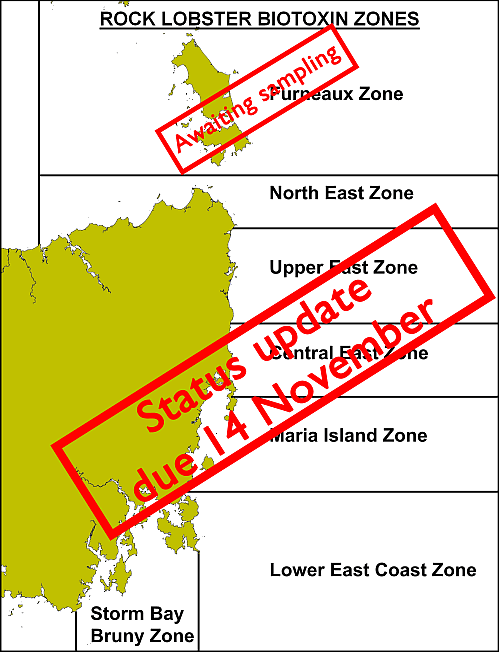 The annual squid closure from Lemon Rock (south of Wineglass Bay) to the northern end of Marion Bay is now in place. The striped trumpeter season re-opened statewide from 1 November.